Panther came to us with the foundation cowherd from Willow Creek (Redline Commercial Herd). He is no longer walking, but was one of the most impressive bulls that we had the pleasure of turning out on the commercial herd. His sheer size and mass were a force to be reckoned with, and he didn’t sacrifice his feet or his soundness of movement along the way. Panther has been our staple black sire in our F1 females, and his daughters have been sold in various groups across western Canada. 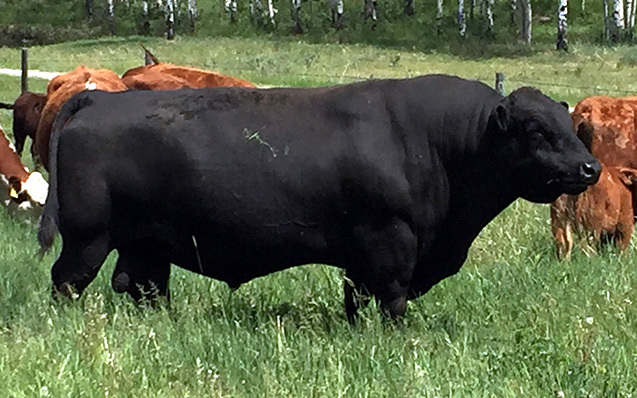 He was a hardy, massive bull, and his daughters have advanced to working baldy females for many cattlemen.